Halloween has passed (I hope you had a very nice and spooky time), and our thoughts are now… on the holidays! That fabulous time of the year where everyone gets busier than ever and stress becomes the most powerful thing there is. Am I wrong? Wouldn’t it be wonderful to have someone do all the holiday shopping for you while you’re working, exercising, or relaxing? What if you could get it all done as soon as possible to avoid all the stress and procrastination that comes with it? Forget about what to shop for, crowded stores and online shopping, wrapping paper and delivery. I’ll work it all out for you! Everyone needs a Personal Holiday Concierge. 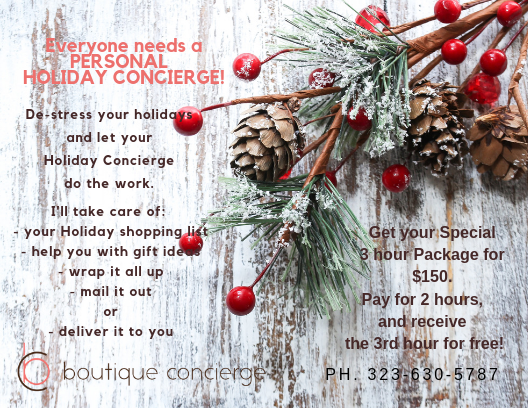 I’ve designed a concierge package with the purpose of helping you avoid all the holiday madness. 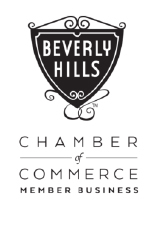 Now you can have your personal concierge help you with your holiday shopping list (family, friends and clients), wrapping, delivery, and all holiday related matters. Giving the gift of time. If you’re one of the very few who can manage the holidays without any help, why not getting the package as a gift for someone and make a difference in his/her life? Trust me, gifting time is the most precious thing you can do for anyone, and that person will remember and thank you forever. Besides, you know at least one person who has it all and you always end up not knowing what to get. Umm, do I need to say anything else? Let me finish with this. Close your eyes for a moment and go back to your childhood. This time of the year was the most exciting of all, and it’s my wish that you can feel that way again. You should look forward to the holidays and enjoy the time with your family and friends, instead of being exhausted and wishing they were over with. Call me a romantic if you wish, but it’s totally possible! Book your hours as soon as you can! Remember Hanukkah falls early this year, and before you know it, Christmas will be on top of us too.